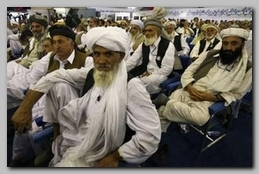 Taliban commanders in Afghanistan said they are willing to explore peace talks, BBC reported on Tuesday 02/01/2011. They say they will do so if they can have more solid guarantees about their own future and safety. The official position of the Taliban is that they are ready to talk peace only after the last US led NATO-ISAF coalition soldiers will leave the country. The Afghan government and its foreign allies say they are making contact with members of the Taliban – but no formal talks are under way. It turned out that the so called Taliban representatives were low level tribal militia leaders, representatives on behalf of themselves and even a famous case of an alleged Taliban leader who was an imposter. Gen. David Petraeus is trying to copycat his success in Iraq by turning over from the Taliban side to Hamid Karzai’s regime by striking agreements or forming unwritten understandings with as many as possible local leaders, tribe elders, local warlords and other influential figures, so far with some success but far from enough to change the strategic map substantially as the Awakening Councils did in Iraq. In Iraq the base of the switch over from insurgency to pro-Government side was the rift between the thousands foreign radical Islamists who flooded the country and tried to impose their attitude on the local Iraqis. In Afghanistan it is a totally different situation (see also -Petraeus Mission). Indeed a Taliban commander from Nooristan, Mullah Malang, is opposed to talks and accuses US and Afghan security officials for breaking amnesty agreements. “We haven’t talked to anyone and we’ll never talk,” he said. One former Taliban commander from Kandahar who said he had entered into an amnesty deal with the government – but is now in constant danger. “First of all, they promised us that they would give us protection,” he said. “We were also told they would give us a house and find a job for us to feed our families…all these promises were not fulfilled. We have not been given anything. They just gave us around $50 and that was it”. The commander said that he had been repeatedly threatened by former Taliban colleagues demanding to know why he left them. “We live in constant danger,” he said. “Security officials intimidate us and that’s why many have rejoined the Taliban” he said (see – Dragon-Strike). Eventually the position of all the Islamic insurgency networks: the Jalaluddin Haqqani’s network, the Hizb-e-Islami network led by Gulbuddin Hekmatyar in the North and the Taliban itself are dependent on their relations with Pakistan (see -Hizb-e-Islami Terms). Pakistan is showing no signs they are willing seriously to seal the common border, to deny safe haven to the Islamic insurgency in Afghanistan and to fight through their own Islamic insurgency on the border regions with Afghanistan (see – I.S.I Involvement). Just on Tuesday 02/02/2011 a Pakistani soldier has been killed and three wounded in a clash with Afghan forces on the border, Pakistani officials say. The clash occurred in the Ghulam Khan area in Pakistan’s North Waziristan region, an area considered to be a sanctuary for Al Qaeda and the Taliban. Some 2,421 civilians were killed in Afghanistan in 2010, most at the hands of insurgents, the Kabul-based Afghanistan Rights Monitor said. Foreign troops were to blame for about a fifth of all deaths – a slight fall on the previous year, the report says.